Broad-billed Hummingbird: Breeds in southern Arizona, southwestern New Mexico, and western Texas. Spends winters south of the U.S.-Mexico border. Preferred habitats include canyons, foothills, and streambeds. 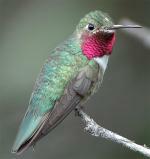 The Broad-billed Hummingbird has a large range, estimated globally at 770,000 square kilometers. It is native to all three nations in North America and resides in subtropical or tropical dry forests or shrublands or in deserts. The global population of the bird is estimated to be between 500,000 and 5,000,000 individuals. It is not currently believed that the population meets the decline criteria for inclusion on the IUCN Red List. The current evaluation status of the Broad-billed Hummingbird is Least Concern. At night, when they are unable to feed, they lower their body temperature and slow their metabolism, thus decreasing their need for food. The intestine of a Broad-billed Hummingbird is hair thin and about two inches in length. 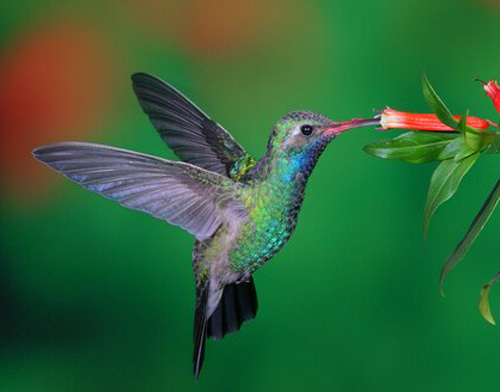 These birds can consume up to 1.7 times their weight in nectar each day. A group of hummingbirds has many collective nouns, including a “bouquet", "glittering", "hover", "shimmer", and "tune” of hummingbirds.